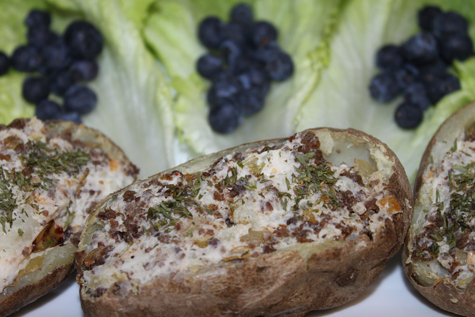 A real fancy appetizer you can make for super bowl party – Baked potato with a twist! While having the potatoes you also get the bite of beef stuffed inside it. This definitely makes the perfect appetizer, especially for a super bowl party. I first baked the potatoes, then scooped out the flesh and mashed it with heavy cream and added browned seasoned ground beef with it. Stuffed the potato skin with the ground beef and mashed potatoes and gave them a final baking. Wash the potatoes and pat dry with paper towel. Prick the potatoes all over with a fork. Place the potatoes on a baking sheet and bake for 55 minutes or until tender. In the meantime, heat a non-stick pan over medium heat and add olive oil. Add the ground beef to the oil, add ground pepper and salt, saute until beef turns brown and well cooked. Add the onions and garlic to the beef and saute until onion turns tender. Add cumin powder and saute for few minutes. When the beef has cooked well, remove from the flame and keep it aside. After 55 minutes, take the potatoes from the oven and let cool down. Cut the top part of the potatoes horizontally and scoop out the flesh from the potatoes leaving behind some potatoes on the skin. Don’t break the skin of the potatoes. Reserve the skin of the potatoes for stuffing. 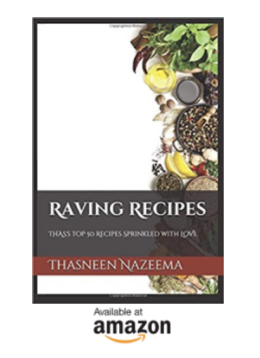 Mash the scooped potato flesh using a potato masher or a wooden fork without any lumps. 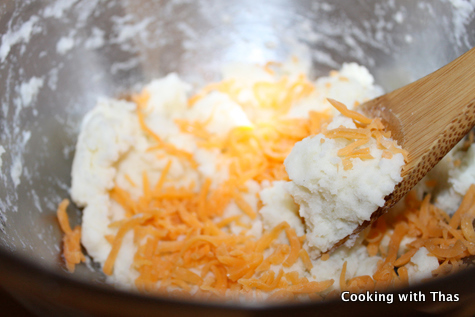 Add the heavy cream, slightly melted butter, ground pepper, salt and cheddar cheese to the mashed potatoes and combine everything well. To the mashed potatoes add the seasoned browned ground beef and mix well. Stuff the potato skin with the ground beef and mashed potato mixture and sprinkle with parsley leaves. 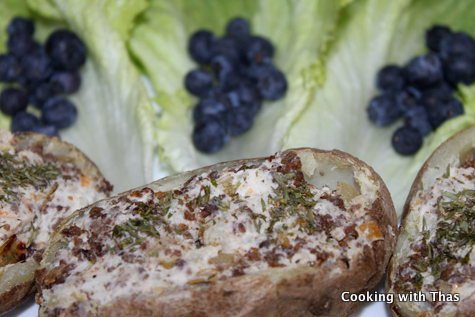 Place the stuffed potato skins on greased baking sheet. Bake the stuffed potato skins for another 25 minutes. When it’s done, place on a platter and serve. You could use fat free heavy cream and fat free cheddar cheese. When the beef has cooked well, remove from the heat and keep it aside. After 55 minutes of baking, take the potatoes from the oven and let cool down. Cut the top part of the potatoes horizontally and scoop out the flesh from the potatoes leaving behind little flesh on the skin. Don't break the skin of the potatoes. Place the stuffed potato skins on a greased baking sheet. When it's done, place on a platter and serve.